This week, I started a two week study on trees in the Bible. Several weeks ago, when we were studying the parables, someone noticed that fig trees are mentioned often in scripture. So, I decided to do a study on them if I ever got a chance. This week, I got that opportunity and decided to do a study on the significance of fig trees this week and one on olive trees next week. The following is the lesson, with a bit of commentary (indented) on the discussions thrown in. From the fig tree learn its lesson: as soon as its branch becomes tender and puts out its leaves, you know that summer is near. The Fig tree is mentioned throughout the Bible more than 50 times from Genesis to Revelation. Aside from figs being a staple food in the middle east, the fig tree is an important symbol in the life of the church. Figs are late blooming, fruit bearing plants known for being very reliable. After the tree of life and the tree of knowledge of good and evil, the fig is the first tree mentioned by name in the Bible. When Adam and Eve heard God walking in the garden, they made clothes from fig leaves to hide their shame. Figs were used as a sign of peace and prosperity, “each man under his own vine and fig tree” (1 Kings 4:25). Figs were also one of the blessings promised to the people of Israel as they journeyed toward the promised land (Deuteronomy 8). What is the difference between prosperity and abundance? Is there a difference? In this discussion, we decided that abundance could be good or bad, depending on perspective, but that God’s abundance is provision. Prosperity involved faith in action. To prosper, Biblically, you use the gifts of God’s abundance for good. One example given was from the parable of the wicked servant. Each servant was given money. The good servants invested and used the money to prosper their master. The wicked servant resorted to jealousy, resentment, envy, etc. and did nothing with what he was given. All had abundance, but not all prospered. Another example came from the often misquoted Jeremiah 29:11. For I know the thoughts that I think toward you, says the LORD, thoughts of peace and not of evil, to give you a future and a hope. (Most translations say plans, instead of thoughts). It is God’s will to prosper us BUT in context he was talking to people in exile. Even in hardship, they were to live a good life and not dwell on their loss. They were to start businesses, have families and set an example for their captors. They were to prosper their captors! What we do with what we are given is our witness to others – even to those who seek to cause us harm. What does it mean to bear fruit? In this discussion, one member of the small group mentioned growing up in church but never actually doing anything. We can be in church every time the doors are open and never bear fruit. In Jeremiah 24, the story is told of the good and bad figs. The story is a vision representing good figs (believers) and bad figs (non-believers). God will be patient with the good figs and never pluck them from the ground. He curses the bad figs and surrounds them with misery. Can a bad fig ever become a good fig? Can a good fig turn bad? How does this compare to our idea of grace? Everyone agreed that a bad fig can become a good fig through repentance. This is, of course, symbolism – fruit does not need to repent. By the same token, a good fig (tree) can turn bad if it doesn’t bear fruit. In scripture, there is an example of a man who doesn’t want to chop down his barren fig tree until he gives it one more season. This is symbolic of grace. Where we did have a problem is in the idea that God curses the bad figs (non-believers) and surrounds them with misery. God draws everyone closer to him through Grace. Some bear fruit, others do not. 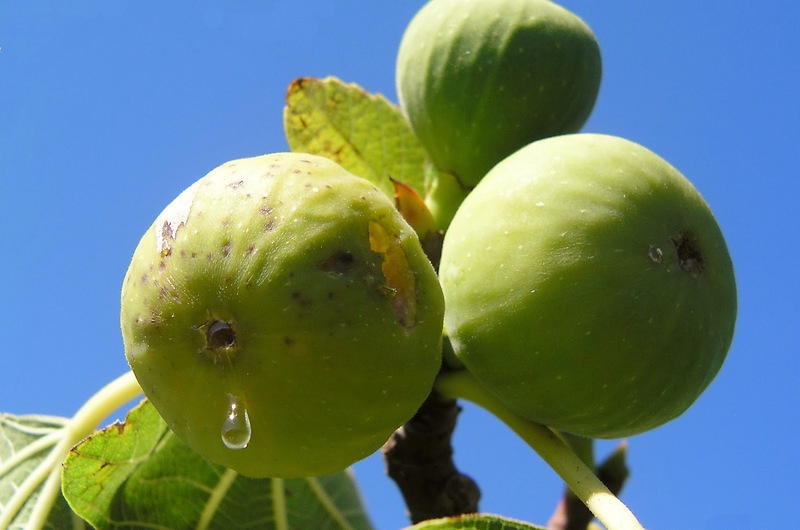 Fig trees are among the last of the fruit trees to grow new leaves each year. However, they begin to grow fruit at the same time they sprout leaves. The immature fruit that grows early is still edible and sweet. The fig grows on the tree and is capable of two harvests a season. The fruit can be stored by drying it or pressing it in cakes to be eaten throughout the year (newtons?). Only the fruit that stays on the vine too long is considered ruined. Whether we are new believers or mature Christians, what can we do to be pleasing to God? Can your spiritual gifts wither away? Jesus cursed the fig tree for not bearing fruit, even though it was not in season. As I mentioned, the fig begins to produce fruit, immature fruit, at the same time it produces leaves. The Old Testament sometimes speaks of covenant-breaking Israel as a barren fig tree (Hos. 2:12; Mic. 7:1–6) but what is the lesson to be learned from this fig tree? The disciples did not appear to understand it, commenting only that it withered quickly. However, this story surrounds the story of Jesus cleansing the temple. Discuss what Jesus did in the temple that day. And Jesus entered the temple and drove out all who sold and bought in the temple, and he overturned the tables of the money-changers and the seats of those who sold pigeons. He said to them, “It is written, ‘My house shall be called a house of prayer,’ but you make it a den of robbers.” (Matthew 21:12–13). This story is also told, in a different order, in Mark 11. Was Jesus angry at the fig tree, or was it part of a bigger lesson? Given the context of the story, what do you think Jesus was really teaching? In this discussion, we again talked about people playing church. Jesus was angry that people in the temple were charging money for things they considered essential to worship. His example with the fig tree was not that he hated figs, it was about bearing fruit. If you don’t use your gifts, you are not useful to God. By the same token, if you are playing church, you are not bearing fruit. Going back to our discussion on prosperity and abundance, how does this lesson relate to that discussion? Hint: Jesus explains to the disciples, who marvel at the withering of the tree, that your prayers have power and whatever you speak will happen IF you truly believe it. Do you believe you have plenty or do you believe you lack much? Perception is important. A few of us shared personal stories of hardship and how faith helped shape the way we handled things. We have all seen people who turn from faith in hardship, get angry, blame God, etc. The fig, again, is a symbol of prosperity and also of perception. The exiles in Jeremiah could have whined and turned from God but that would not have produced spiritual fruit. Definition: an opinion or decision that is based on careful thought. In Jeremiah 5, one of the consequences of judgment against Israel is the destruction of fig trees. Does God take away our gifts, our abundance, our prosperity, if we ignore him? In Revelation 6:12-13, stars falling to earth are described as “late figs drop from a fig tree when shaken by a strong wind.” We have already discussed figs left to wither on the tree. How can we apply this analogy to our spiritual lives so that we don’t fall away when shaken? The quote at the top of the page, Matthew 24:32, talks about the reliable fig tree announcing the coming of summer. The reliable believer, likewise, announces the kingdom of God. We can only do this if we use our gifts as they are given to us. Some people preach, others teach, some go on missions. Every believer has a ministry. To avoid becoming the basket of rotten figs, we have to be obedient and serve wherever we are in life.